The Runner may spend click to break any subroutine on Eli 1.0. "That's against the rules. The Creators will be angry." 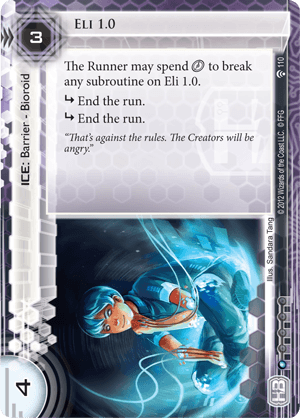 As a bioroid, the Runner can spend 2 to break it, but this isn't really a downside as getting the Runner to spend half their turn's clicks on one cheap ICE is a huge tax. This kind of ICE is not really meant for defending scoring remotes, but rather to prevent the Runner repeatedly running R&D or HQ. At only 1 influence, Eli is included in just about every taxing Corp deck. Even when you aren't focusing on taxing the Runner it can be a value include to prevent central server abuse from cards like Keyhole.